It can be argued that 1937 was the year of director Leo McCarey. 1937 was the year McCarey released the classic slapstick comedy The Awful Truth starring Cary Grant and Irene Dunne. The Awful Truth was such a hit film that it went on to be nominated for Best Picture and Leo McCarey was awarded the Best Director Academy award for his efforts. It is reported that during his acceptance speech he thanked the Academy and then stated however that they gave him the award for the wrong movie. The movie he was referring to in his speech was the other film McCarey directed in 1937, Make Way For Tomorrow. This was, with little doubt, a bold statement from someone who had just received the top honor in his profession for a comedy that is as funny today as it was when it hit theaters over 70 years ago. Up until last night I would have had to personally disagree with Mr. McCarey’s statement out of loyalty to The Awful Truth. However, after finally getting a chance to experience the brilliant and poignant beauty that Make Way For Tomorrow offers, I think I’m now inclined to agree with Leo. Make Way For Tomorrow is said to be the inspiration for script that became Yasujiro Ozu’s Japanese cinematic classic, Tokyo Story. Make Way was almost forgotten when Criterion rescued it from obscurity and re-released as part of their now legendary collection of films. 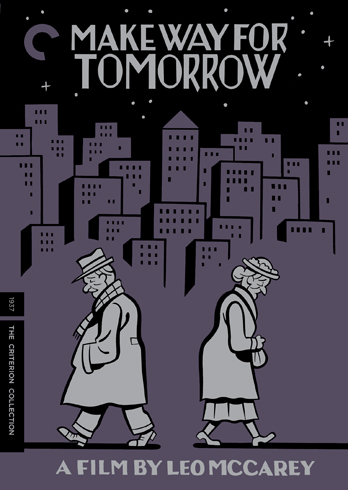 On their website Criterion describes the film as “…one of the great unsung Hollywood masterpieces, an enormously moving Depression-era depiction of the frustrations of family, aging, and the generation gap…Make Way for Tomorrow is among American cinema’s purest tearjerkers, all the way to its unflinching ending, which McCarey refused to change despite studio pressure.” I couldn’t put it any better myself. I truly am excited to say I saw it and it comes with my highest recommendation. Again, where did you find this? Make Way for Tomorrow was another Netflix DVD viewing. It is a Criterion Collection film and I’m definitely going to pick it up soon.